Mayor Coleman's State of the City: Bikeways! Mayor Michael Coleman's State of the City speech last night was full of great ideas and great leadership. I really didn't care for him before he became mayor, but I have to say that I really like what he's done since taking office. And he had a few things to say that will interest cyclists! "We are far too reliant on the automobile. Our city was built to accommodate them with roads, highways, stop lights, parking meters and traffic jams. And as we sit at the traffic light, waiting for it to change, or on the cell phone or stuffing a doughnut in our mouth our belts are getting tighter because our waists are getting bigger. "We can do better, and rather than be hungry for a doughnut, we should be hungry for new throughways like bikeways! "Tonight I am proud to announce that we will make our start this year, and I am committed to investing $20 million to build 86.3 miles of new on-street and off-road bike routes and trails by 2012. This will be funded by our current capital budget and by the Bicentennial Bond Package going on the November ballot, if our voters agree. "That includes 54 miles of new on-street bike routes and lanes by the bicentennial, which will require rebuilding dozens of intersections in this city to make them safer for walkers and bikers alike. "In the next four years, we're also adding new bike racks, bike lockers, and water stations for riders. This is just the start, as we wrap up the Bicentennial Bikeway Planning process, which will guide further construction and bikeways planning for many years to come. "This plan sets a higher standard for bike safety, convenience and connectivity. We will team up with Franklin County Metro Parks and other regional partners as they build another 49 miles of bike trails by 2012. I want to thank all our partners, especially MORPC, and the bike riders, bike commuters and neighborhood leaders. "Let's take advantage of our city's flatness. Flat is good. We haven't beaches and oceans, we haven't mountains to climb, but we do have hundreds of square miles of flat land, and we should make the most of it and make biking the No. 1 outdoor activity, something everyone can do. "So, watch out Ford, wake up Chrysler, take a break Toyota, GM will no longer stand for General Motors -- but Get Moving! We will be moving on bikes -- all over our city. "Bicycling and walking are great for your health. We need to encourage that and other healthy habits in all our residents and especially in our children. We need to protect our children by fighting their enemies -- obesity and diabetes. "Columbus has among the nation's highest levels of obesity, diabetes and heart problems. Tonight, I am announcing the creation of the Foundation for Healthy Lifestyles, a group that will raise money to promote healthy living and encourage residents to take on individual responsibility for healthy living. "That means bending your elbows to do push-ups, rather than lifting a cheeseburger to your mouth. That means making our children move their feet outdoors, rather than using their thumbs to play video games in front of a TV. "Our foundation's first event will be a bicycle tour -- called the Tour De Columbus, an event for families linked to the annual Long Street professional bike races. Bicyclists will begin in the King-Lincoln District, on Aug. 23 for the first ride." There seems to be little discussion about how all this is actually going to work. 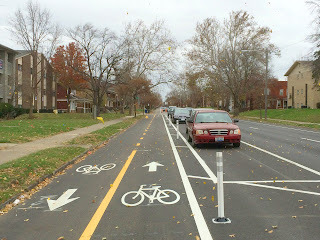 Bike lanes are great, and bike paths are improvements for all of us. But as I've said before, and will continue to say here until it actually happens, the key to bike planning in this city doesn't lie with new infrastructure: it lies with attitudes. And it lies particularly strongly with how traffic codes are enforced in this city. I've talked about this enough and I'm not going to go over it again, but suffice to say it's necessary. Mr. Mayor, thank you. These plans sound wonderful, and I look forward to taking part in the Tour de Columbus. But keep in mind that infrastructure isn't going to solve all our city's problems. Enforcement is a key issue as well. 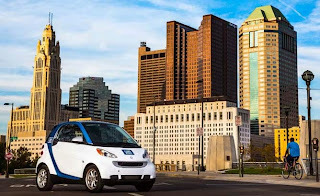 All in all, it seems that we in Columbus are in for a wonderful future - cleaner, safer streets, better transit, and plenty of places to ride. Mayor Coleman needs to do a few basic things with his own people before he can call himself a cycling advocate. Columbus Police don't know the law about cycling. They pull people over for doing things that are perfectly legal, and worse for doing things that are legal, and also the safest among available options. I've been pulled over twice now for taking the middle of the lane in a no passing zone to avoid being squeezed by motorists. A cop actually told me that I was "forcing drivers to break the law" when they had to pass me in a no passing zone. No passing zones are designated as such because it's not safe to pass. Have you been ticketed? Or just warned? I love the comment about "forcing drivers to break the law!" No one is FORCING them to pass you... that's just ridiculous.